The peers of drummer/composer Bill Bruford are few and far between; only Jack DeJohnette, Billy Cobham, Will Calhoun, and Claudia Quartet mastermind John Hollenbeck spring to mind as drummers who compose these kinds of knotty leap-off points for world-class improvisers. Tim Garland is the talented co-conspirator who rearranged and re-imagined both the oldest EW material as well as several more recent tunes. 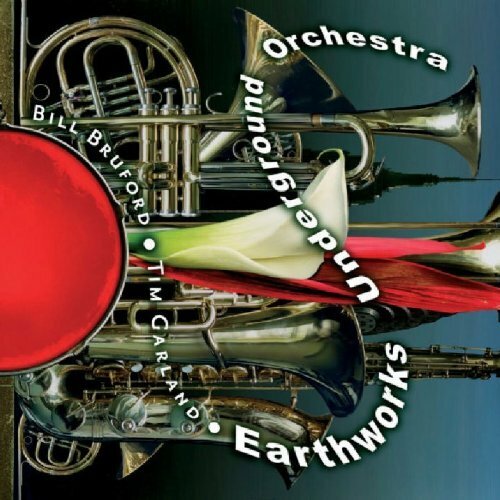 Four prime cuts from Earthworks’ first recordings are presented in full nine-piece band arrangements, including “Up North” where the solos and last melody are much better stated at the end of the song. “Libreville” is a powerful samba in 15/8, where Garland’s re-arrangement is perfect. Best realized performances include “Pigalle” with the French themes coming through in Garland’s lead sax lines. “Bajo del Sol” has a fuller sound in this larger incarnation and it includes what might be Bruford’s best drum solo on record. “Speaking in Wooden Tongues” is a superb chart by Garland that is also played well by the entire band. “Footloose and Fancy Free” is rollicking. Earthworks is “a parculiarly (sic) British sort of institution” states Bruford himself. “There are also Americans in this band and we like the blend.” The special edition of the release also contains two additional tracks which round out the live performance and justify the additional expense. Bruford and Garland have created a live monster which needs to stretch its touring legs, but without higher profile label support or some other miracle, one can only hope for a live DVD to chronicle a new peak in Bruford’s career.